Moneta obiegowa o nominale 1 lita wyemitowana z okazji 600. rocznicy bitwy pod Grunwaldem. Bitwa pod Grunwaldem, jaka miała miejsce w dniu 15 lipca 1410 roku, to wydarzenie bez precedensu w historii państwa polskiego. Zakończona wraz z nią wojna z Krzyżakami stanowiła kolejną odsłonę ponad stuletniego konfliktu. Bitwa trwale wzmocniła pozycję państwa polskiego w średniowiecznej Europie i osłabiła sytuację polityczną zakonu krzyżackiego. Today the Bank of Lithuania issued three collectors (commemorative) coins to commemorate 600th anniversary of the Battle of Grunwald (Zalgiris): gold 500 litas and silver 50 litas collectors (commemorative) coins and 1 litas collectors (commemorative) circulation coin stricken of alloy of copper and nickel. The coins were presented to the public in the Lithuanian Art Museum, Vilnius. The event started with a minute of silence which was observed in memory of the late President Algirdas Brazauskas. The Chairman of the Bank of Lithuania Reinoldijus Sarkinas said: “Since school, in Lithuania we all know that the Battle of Grunwald - which took place on 15 July 1410 when Polish and Lithuanian troops defeated the Order - is a special moment in our history that determined the development not just of the Grand Duchy of Lithuania and the statehood of Lithuania as a whole but also the predestination of neighbouring and Eastern European countries in the 15th century and later. Recognising the importance of this event, the Bank of Lithuania’s respond was inventive: for the first time we issued three coins at one time - they are of three different metals and denominations. Designer of the coins Rytas Jonas Belevicius depicted moments of the Battle of Grunwald on one side of the coins. The reverses of gold and silver coins illustrate horsemen and infantrymen reflecting pictures from mediaeval books. 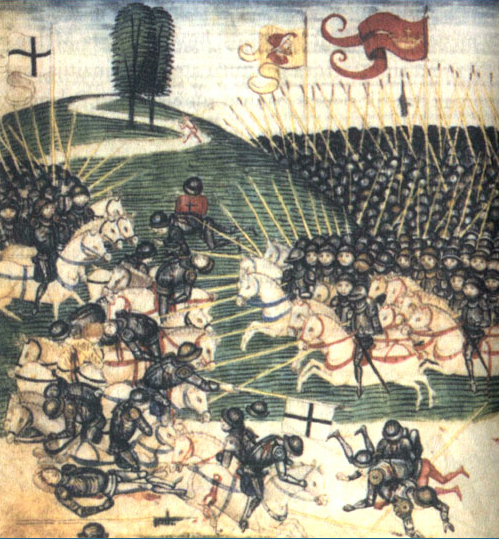 The fight is depicted somewhat theatrically and the size of figures is dispensed according to their weight in the composition and a hierarchy of that time. Details of closing, armour and weaponry characteristic of the time were conveyed as precisely as possible. According to the designer, decorative arrangement of spears on the reverse of 1 litas coin slightly reminds of the course of the Battle. The edges of gold and silver coins bear stylised 15th century spearheads and the edge of 1 litas coin is rimmed at intervals. Gold and silver coins dedicated to the 600th anniversary of the Battle of Grunwald are already 63rd and 64th collectors (commemorative) coins by subject and image issued by the Bank of Lithuania after the restoration of independence. Moreover, six 1 litas circulation coins have been issued that are of the same or similar design as collectors (commemorative) coins the latest coin of which is dedicated to the anniversary of the Battle of Grunwald. The coins were minted at the Lithuanian Mint. Mintage of 500 litas coin is 5,000; mintage of 50 litas silver coin is 10,000; mintage of 1 litas coin from alloy of copper and nickel is 1,000,000. On the occasion of the 600th anniversary of the Battle of Grunwald, central banks of other three countries (Poland, Ukraine and Belarus) will also issue collectors (commemorative) coins. Their images were demonstrated during the above event in Vilnius.